I’ve been meaning to document our experiences as we’ve begun living the ranch/farm life. Our little piece of property has be wonderful. We’ve done a great deal of work to get the barn and pasture functional over the last year and a half for our 4 horses, 16 chickens, 6 ducks, 6 dogs and innumerable number of gophers. We decided to leave the city for a number of reasons, but being closer to our horses, giving our children opportunity to experience the out doors, and beginning to live off the land are a number of them. To be perfectly honest, the tipping point for me was being able to leave a home owners association behind. But, I digress . . .
We were very excited by the prospect of having almost two acres of Bermuda pasture to graze our horses on. 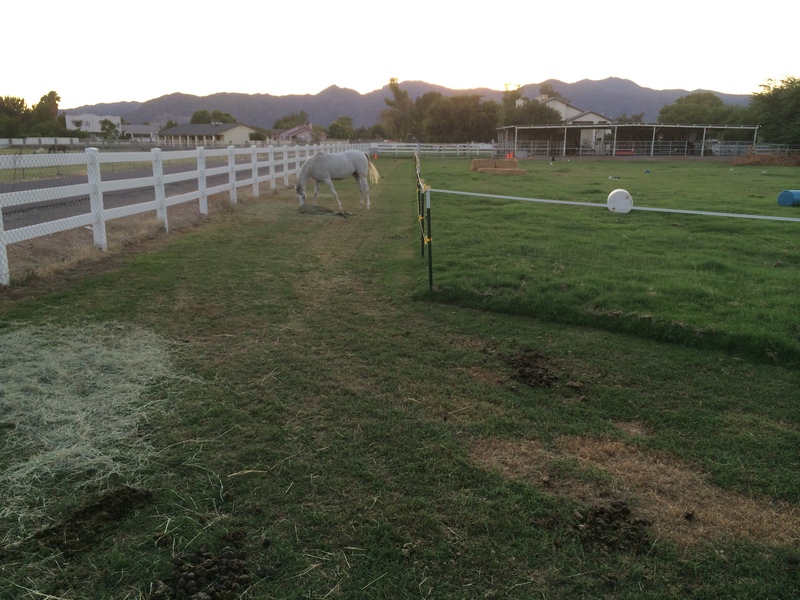 Lots of time and effort was placed into greening up the back pasture for the horses. However, we came to learn a hard lesson. . . barefoot horses don’t do well on green pasture. One of our horses is insulin resistant and doesn’t do well on higher carbohydrate containing feeds. We thought we had solved this problem with the Bermuda pasture. To our dismay, three of our horses began showing signs of laminitis in the last month. And, according to our vet, one of them, was near foundering. Much reading, some very interesting new treatment approaches, a number of vet calls, and training with some barefoot experts ensued. We had a chance to visit with Dr. Tomas Teskey up in Mayer, Arizona, and found some wonderful information on his Facebook page. We learned that because of Arizona’s arid climate, a swing in temperature can cause a spike in the carbohydrate content of any type of grass. 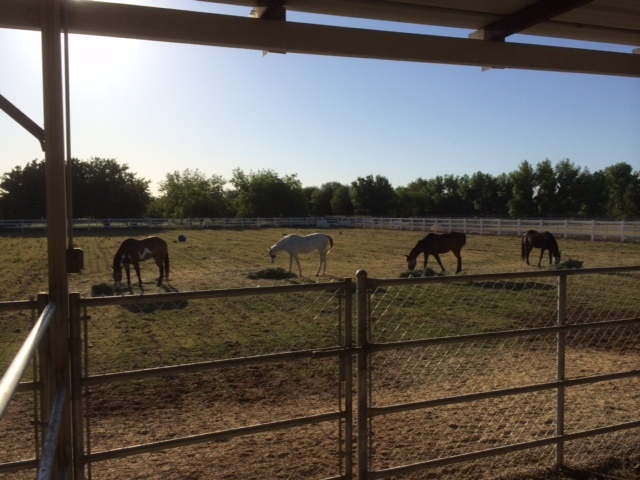 Between cutting the grass, recent temperature spikes and the horses grazing on the Mesquite pods that fell from the trees in the back pasture, their feet have become very tender. We added pea gravel to the stalls in hopes that the abrasive surface in the stalls would compensate for the soft lush pasture. It firmed up the soles but it didn’t help stop the laminitis. Come to realize that the only way a barefoot horse is going to improve his hooves is movement, and lots of it. The average horse on a pasture walks less than half a mile per day. That means that standing all day and grazing one spot in the pasture or the stall can’t happen. So, over the last few weeks, our lush green pasture has been converted into a Paddock Paradise. 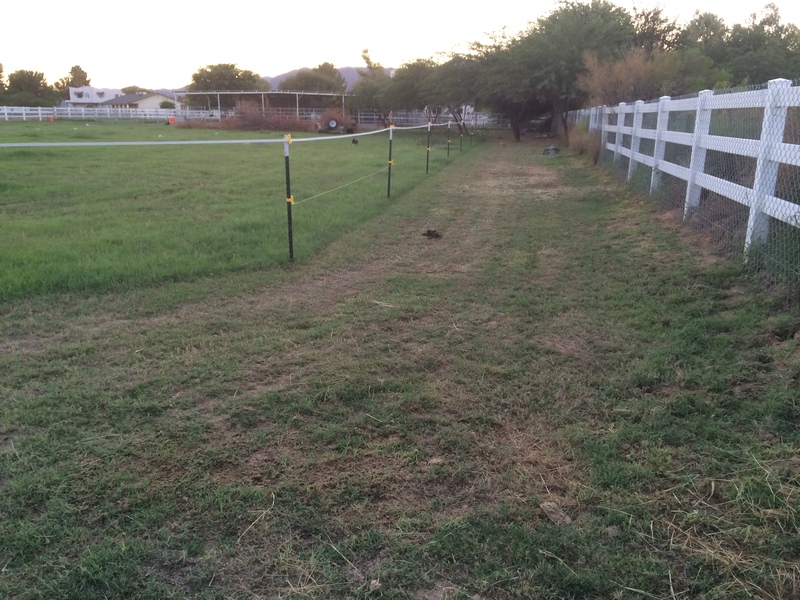 Using hot wire fencing, we created a 15 foot track around the perimeter of our one acre pasture. Feed is placed at the back end of the paddock and water is at the front end. 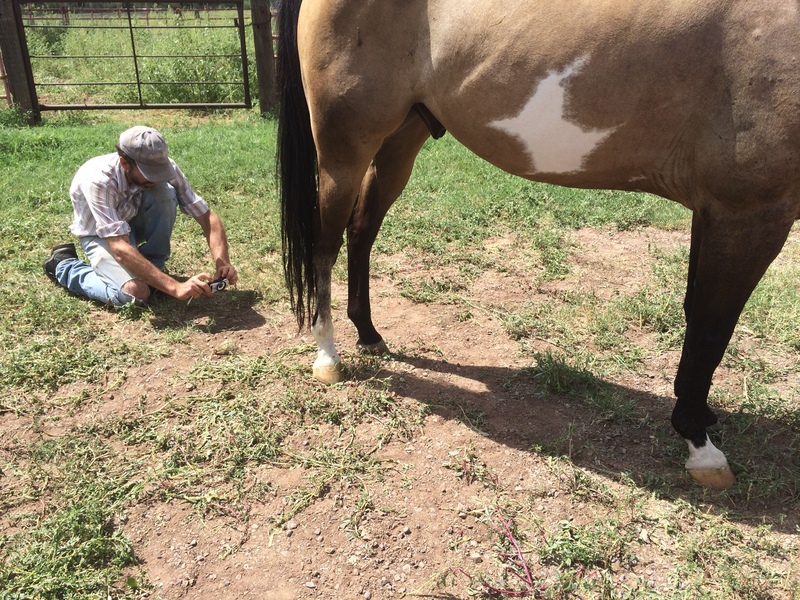 Within the last two weeks we have noticed the horses have increased their movement by 3-6 times and there is a dramatic change taking place in the hoof wall and soles of all of the horses. Now, the second thing was ensuring that the diet changed. 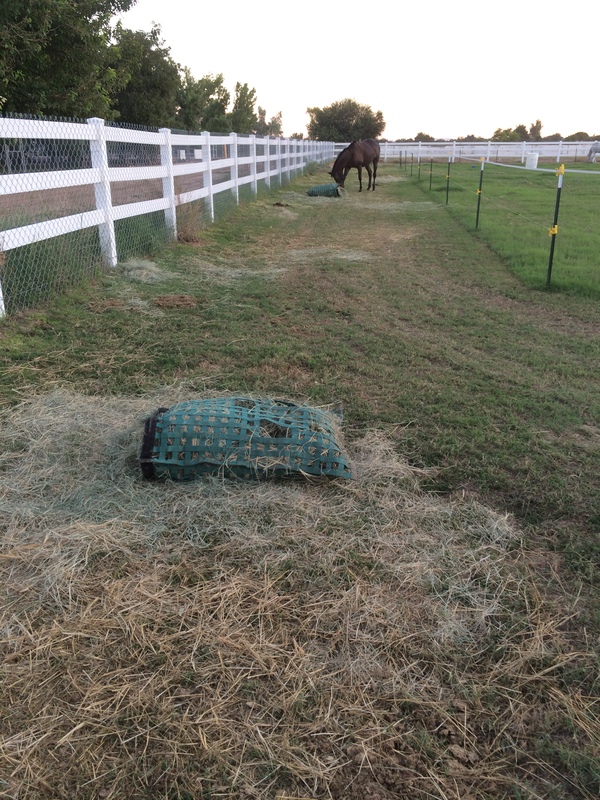 The horses have been placed on a diet that is strictly Bermuda and Timothy grasses with the only supplement of a non-molasses bound Bermuda pellet. The Mesquite trees have been trimmed up dramatically and all the pods have been removed. The pasture grass has been scalped with the mower and will take a few more runs with the tractor gannon to remove the grass. The goal, now is to bring in some different surfaces around the paddock including sand, pea gravel, dirt, and a watering hole. All in good time . . .